It's today's "news" about backdoors found in multiple Barracuda gears. Basically, Barracuda appliances have multiple hardcoded system accounts and firewall rules specifically designed to allow remote assistance. If you want more gossip, you can read about it on KrebsOnSecurity, The Register or The H Online. Although it's natural to be surprised that such a critical issue has been underestimated for nine years, we should rather use this opportunity to stop these bad practices. Unfortunately, it's not just Barracuda - many vendors have adopted similar poorly-designed solutions for remote assistance. As customers, we should always evaluate products, pretend more accountability and transparency. In 2011, while helping a friend during the setup of his network, I came across the advisory from 2004 and I started investigating. After having confirmed the issue, I decided to patch the virtual appliance on my own. If you think that the mitigation provided by Barracuda in the security definition 2.0.5 is not adequate for your environment, keep reading. Hopefully, Barracuda will reconsider the situation and you won't need to manually patch your device. Disclaimer: Use this information at your own risk! You may end up with a broken appliance and no more vendor warranty. Also, I am not a lawyer and I haven't reviewed the product EULA. Finally, note that this method has been tested against the Barracuda WebApp Firewall 660vxl (v7.5.0.x) virtual appliance only. Removing system accounts and changing iptables configuration require privileged shell access. As the original techniques for rooting the device are now deprecated (at least in the device I had), I started looking for other ways to get a root shell. Soon, I realized that it's possible to abuse the recovery partition in order to include arbitrary resources. This technique requires "physical" access to the appliance and multiple reboots thus I consider it better than disclosing the root password and suggest you to abuse the backdoor in order to patch the device. 1) Boot the Barracuda virtual appliance with a standard Linux distribution (e.g. booting from the virtual CD) and mount the recovery partition (/dev/sda9) in order to copy the patcher script (rootme.sh). 2) From the web console, revert the firmware to the factory installed version (Advanced-->Firmware Update-->Firmware Revert) and reboot again the appliance. If the factory Firmware Revert button is not available (it's gray and cannot be selected), you need to update the device to the newest firmware and repeat the entire process. 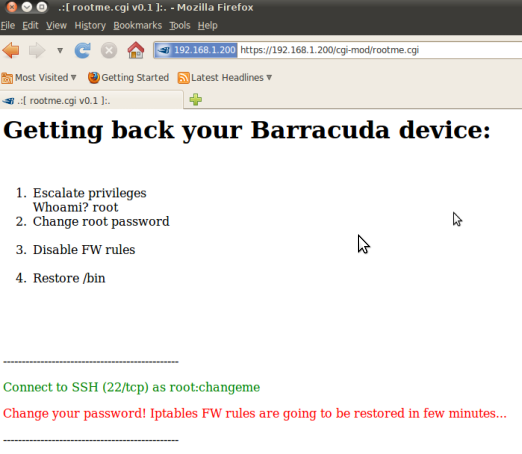 3) Visit https://barracuda_ip/cgi-mod/rootme.cgi. After that, you can connect via SSH to the device using a temporary root password. Removing the hardcoded system accounts and changing iptables is left as exercise. Privileges escalation is possible due to an insecure sudoers configuration. Again, nothing fancy. Please note that I have reported this misconfiguration to Barracuda on 09/12/2011. No matter how good a Java obfuscator is, the bytecode can still be analyzed and partially decompiled. Also, using a debugger, it is possible to dynamically observe the application behavior at runtime making reverse engineering much easier. For this reason, developers often use routines to programmatically detect the execution under a debugger in order to prevent easy access to application's internals. Unfortunately, these techniques can be also extremely annoying for people with good intents. Over the course of the years, starting from the very first release, I have been an enthusiastic supporter of Burp Suite. Not only @PortSwigger was able to create an amazing tool, but he also built a strong community that welcome each release as a big event. He has also been friendly and open to receive feedback from us, ready to implement suggested features. Hopefully, he won't change his attitude now. Since a few releases, both Burp Suite Free and Pro cannot be executed under a debugger. Unfortunately, this is a severe limitation - especially considering the latest Extensibility API. The new extensibility framework is a game-changer: it is now possible to fully integrate custom extensions in our favorite tool. But, how to properly debug extensions in an IDE? Troubleshooting fairly complex extensions (e.g. Blazer) requires lot of debugging. Setting breakpoints, stepping in and out of methods, ... are must-have operations. Inspired by necessity, I spent a few hours to review the anti-debugging mechanism used in Burp Suite Free. According to Burp's EULA (Free Edition), reversing does not seem to be illegal as long as it is "essential for the purpose of achieving inter-operability". Not to facilitate any illegal activity, this post will discuss details related to the Free edition only. Disclaimer: Don't be a fool, be cool. If you use Burp Pro, you must have a valid license. Or again, it is possible to override the System.exit() method with a local method using an empty body. First, we need to create a fake static exit(int) method. Then, we replace System.exit() with the custom method within our class. With the honest intent to simplify the life of coders writing custom Burp's extensions, I have developed a small utility (BurpPatchMe) to patch your own copy of Burp Free - which will allow you to debug your code in NetBeans, Eclipse, etc. BurpPatchMe works for Burp Suite Free only. I have included a specific check for it as well as I have used a technique compatible with that release only. Again, you won't be able to remove debugging in Burp Suite Pro using this tool. Go and buy your own copy of this amazing tool! BurpPatchMe does not contain any Burp's code, library or resource. It is your own responsability to accept the EULA agreement and its conditions, before downloading Burp Free. Also, this tool is provided as it is - please do not send emails/comments asking for "features"
Long life Burp Suite and happy extensions!